Elisabetta “Lizzy” Tosi visits legendary Amarone winery Quintarelli, founded by octogenarian Giuseppe Quintarelli. 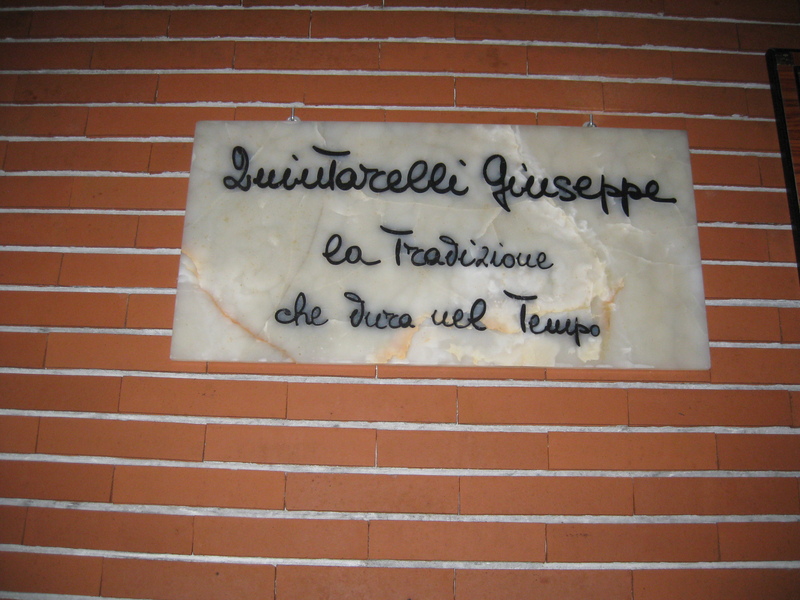 There, wine is made the same way it has been since Giuseppe’s father moved to this land in 1924. And the Amarone wines are still released only after many years of ageing in the Quintarelli cellars. I deliberately ask this targeted question. Francesco Grigoli is Giuseppe Quintarelli’s grandson; Francesco, it seems to me, has inherited his grandfather’s calm, thoughtful manner. He doesn’t answer my question, but he welcomes us, and leads us to the barrel area where we see the family’s oldest and most historical barrels, those with symbols carved into the wood: two peacocks, a cross, a bunch of grapes, a cup. Giuseppe Quintarelli is not on hand; he is very reserved, and shuns publicity. And so his wines became myths, too: a fresh white wine called Bianco Secco (Dry White), the young red wine Primofiore (First Flower), the Valpolicella Classico, the Recioto della Valpolicella Classico and the icon of the icons: Amarone della Valpolicella Classico. All of them are labeled with a simple handwritten piece of paper and, until a few years ago, each label was stuck on by hand, with glue and brush. Today, the labels are printed and attached by machine, but the style is the same. The Quintarelli winery is located in the small hamlet of Cerè near the village of Negrar, which is the historical heart of Valpolicella. 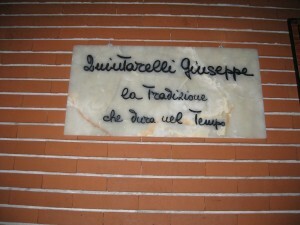 Quintarelli’s family has lived here since 1924, when Giuseppe’s father sharecropped nearby vineyards. Back then the wine was exported to USA in 50 liter barrels. The vineyards surround their home and cellar, on the hill called Monte Ca’ Paletta: 3 hectares planted in the pergola veronese system for the local varieties (Corvina and Corvinone), and guyot for the international (cabernet sauvignon, cabernet franc, merlot). Some plants are very old (50 years), others younger. “My grandfather was one of the first to work with Cabernet,” explains Francesco. “His famous wine Alzero is a blend of Cabernet Sauvignon, Cabernet Franc, and a small percentage of Merlot.” Other vineyards (8 hectares) are located among the villages of Sant’Ambrogio di Valpolicella (Conca d’Oro), Valgatara and in the eastern part of Verona, in Montorio. 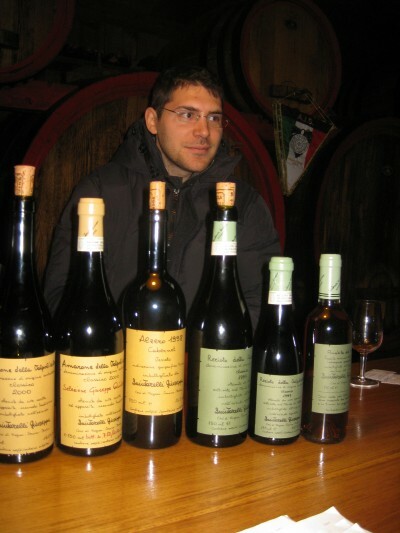 Francesco grew up in his grandfather’s winery. He vividly remembers summers spent gathering cherries and helping his father in the cellar, and the autumn grape harvests. After getting his degree in Economics at University of Milan, he spent most of the next seven years working abroad. Last summer he decided to return to work at home, in his grandfather’s winery. He is in charge of foreign markets and public relations. How many bottles do you produce? Quintarelli is very famous all over the world, but what are some of the new countries you are exporting to? “Peru, Indonesia, Kazakhstan… Quintarelli wines are also in Thailand, China, Singapore, Brazil, Canada, Japan, Russia. In the USA we have had the same importer for 35 years, he is practically one of the family,” Francesco relates. Even now, Quintarelli does not need to look for new importers in the newer markets: importers line up at the door for these wines. Do you have any special plans for the future? 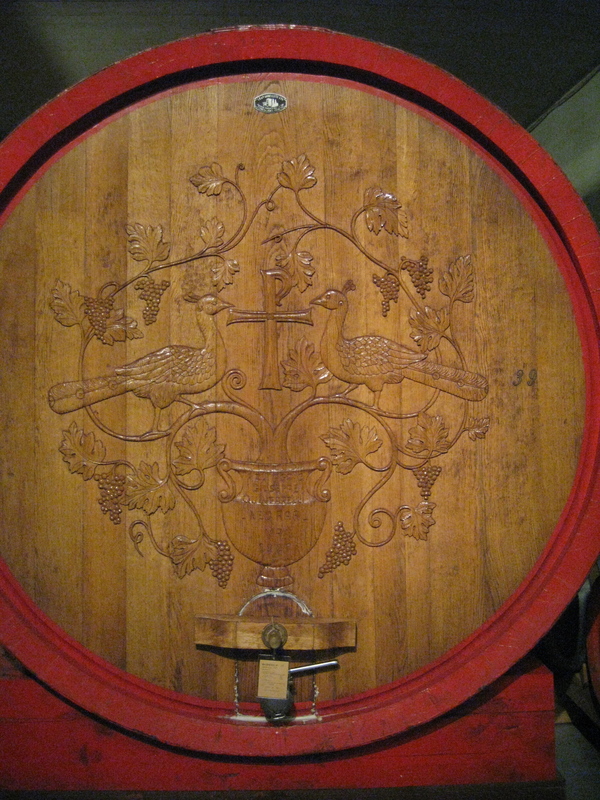 The world has changed greatly since 1906 when Giuseppe Quintarelli’s parents travelled for five days with two horses to take 50 liter barrels of their wine to Genoa for shipping. Today, wine is produced everywhere in the world. The competition gets fiercer every day. Is there room for a romantic winery like Quintarelli? Very nice piece on a very special producer. A bottle of Quintarelli – his “lesser” Rosso del Bepi, in fact! – was the first wine that changed me. I can remember what the room looked like, the music that played. What a unique and powerful experience. I wonder what Francesco says about dal Forno’s wines? Wonderful post about this iconic producer. You asked the right questions! Happy you’ve appreciated my work. Thank you Tom! I’m planning to be in the area in July. Do you have contact information so that i can arrange a visit? Hi Lizzy my name is Murilo, from Brazil, lawyer, sommelier and wine journalist fot three magazines and oen newspaper. 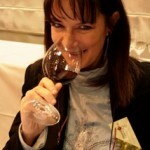 I will be staying in Verona on Oct18 and would like to visit QUINTARELLI to do a story, some photos and tasting. How do I contact them? I could not find their website on internet. Im a true fan of Quintarelli wines here in Brazil. By the way Im sales representative VINCI in Sao Paulo. Could you help me contact them. Thank you very much.